General Orthopedics, with a special interest in knees, shoulders and sport medicine. In addition to his Texas Medical License, Dr. Hoffmann is certified by the American Board of Orthopaedic Surgeons. Dr. Hoffmann has a special interest in sport related injuries. He has been the team physician for the Brazosport Independent School District teams for more than 20 years. 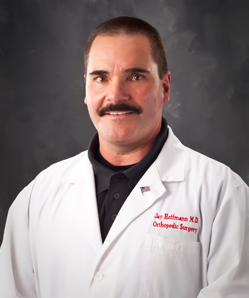 Dr. Hoffmann is an avid sportsman and enjoys fishing and hunting. He has lived in Lake Jackson for over 25 years with his wife, Patti, and their three sons.